This next recipe is certainly a change of pace from some of our other more recent postings. Southwest Salmon and Pasta is a delicious meal jam-packed with vibrant colors which is great since we all know the value of eating colorfully. The recipe below is enough to serve four so feel free to double it and invite the neighbors over for a surprisingly irresistible twist on pasta with salmon. As much as we all love seafood, there is nothing worse than spending your afternoon preparing a fabulous recipe for your family only to find that the seafood you picked up at the grocery is less than fresh. Not only does it ruin your appetite, low quality seafood can make you and your guests seriously sick. We hope you’ll depend on Passanante’s Home Food Service to deliver the highest quality and always fresh ingredients you need to feed your family. Our food delivery service can stock your home with everything from lobster tails to organic veggies and melt in your mouth filets. If you’re interested in a free sample let us know by filling out this form on our Facebook page. Simply rub the salmon with olive oil, sprinkle with seasonings, and toss on the grill. That was easy! Chop peppers, onions, basil, and arugula. Heat oil in a large skillet. Once the oil is hot, add minced garlic, peppers, and onions. Stir frequently. When almost soft, add basil and arugula. Cook about 2 more minutes. Turn off heat and let sit for several hours to meld flavors. When ready to serve, cook pasta according to package directions and strain in colander. Add 1 tablespoon of olive oil and stir. Cut salmon into bite-sized pieces and add to vegetables in skillet. Heat until hot adding a few tablespoons of butter to give the mixture a saucy consistency. Put helpings of pasta on individual plates, top with salmon mixture and sprinkle with parmesan cheese. 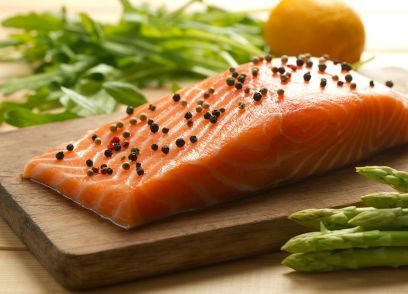 This entry was posted in Recipes, Seafood and tagged Food Delivery Service, Organic Vegetables, Passanante's Home Food Service, Recipe, Salmon by Passanante's Home Food Service. Bookmark the permalink.